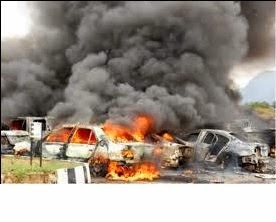 It is another sad morning in Nigeria as an early morning bomb blast in Nyanya, a surburb of Abuja has claimed many lives with no exact figures on fatalities. Security forces are on the ground and are trying to manage the situation with the injured transported to hospitals in the Federal Capital Territory. A call for blood donors has also been made to help treat the casualties at the hospitals. President Goodluck Jonathan is reported to have cancelled his scheduled trip to Ibadan and is expected to visit the scene to see things himself. Boko Haram have attacked Abuja and its suburbs in the past and will be the biggest suspects of this crime.